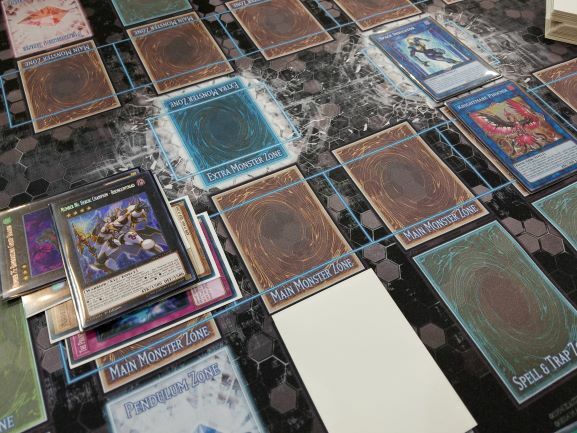 We’re down to the final round of Swiss – after this, only the Top 32 Duelists will advance. 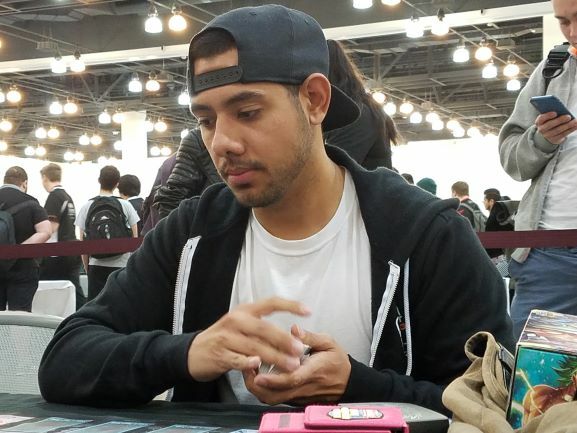 Jonathan Rosario is a Los Angeles Duelist, and one of the only Burning Abyss Duelists still in contention. 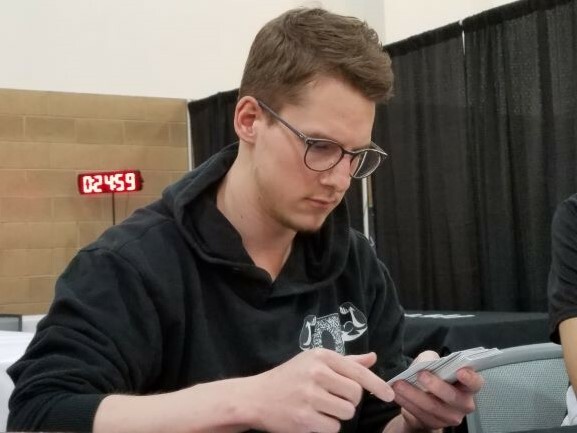 His opponent is Roman Kieser, here from Switzerland, and playing a DARK Warrior strategy which looks to establish an unbreakable field with Number 86: Heroic Champion – Rhongomyniad. Kieser won the dice roll and played first. He Special Summoned Junk Forward, then Normal Summoned Marauding Captain without using its effect. He Link Summoned Isolde, Two Tales of the Noble Knights, sending Divine Sword – Phoenix Blade, Noble Arms – Arfeudutyr, and Overdone Burial to the Graveyard to Special Summon The Phantom Knights of Ragged Gloves. He added Phoenix Blade to his hand by banishing his Warriors, then activated D.D.R. – Different Dimension Reincarnation! He discarded Destiny HERO – Malicious to Special Summon Junk Forward. Then, he used Malicious’s effect to Special Summon another Malicious. He used Malicious and Isolde to play Summon Sorceress, and used it to Special Summon Armageddon Knight. He Special Summoned his third Malicious, using it with Ragged Gloves and Summon Sorceress to play The Phantom Knights of Rusty Bardiche! It sent The Phantom Knights of Ancient Cloak to the Graveyard to Set The Phantom Knights of Shade Brigandine on the field, and he banished Ancient Cloak to add The Phantom Knights of Silent Boots to his hand. He flipped up Shade Brigandine, combining it with Armageddon Knight to play Number 86: Heroic Champion – Rhongomyniad! He Special Summoned Silent Boots, then played Living Fossil to revive Ragged Gloves. He stacked Gloves, Boots, and Junk Forward to play Number 75: Bamboozling Gossip Shadow! He attached it and all its materials to Rhongomyniad, giving it a total of six Xyz Materials! Rosario had a hand of Orbital Hydralander, Destiny HERO – Malicious, two Fiendish Rhino Warrior, Danger!? Tsuchinoko?, and Fabled Soulkius. He thought about his options, but knew he wouldn’t be able to play through a six-material Rhongomyniad! Rosario would have an advantage going into the second Duel, since he hadn’t yet revealed any cards to Kieser. 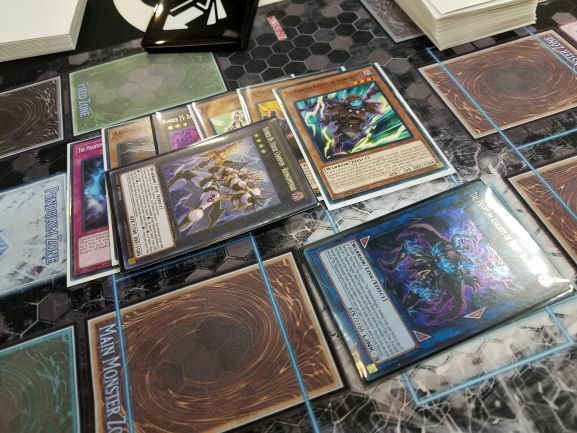 Rosario played first this time, and started with Sekka’s Light; Fiendish Rhino Warrior; Gallis the Star Beast; Scarm, Malebranche of the Burning Abyss; and Ghost Reaper & Winter Cherries. He played Sekka’s Light to draw Farfa, Malebranche of the Burning Abyss and Libic, Malebranche of the Burning Abyss. He Normal Summoned Fiendish Rhino Warrior, then Special Summoned Farfa. He Xyz Summoned Dante, Traveler of the Burning Abyss, sending Droll & Lock Bird, Scarm, and Orbital Hydralander to the Graveyard for its effect. The detached Xyz Material, Fiendish Rhino Warrior, sent Fabled Soulkius to the Graveyard as well. He banished Sekka’s Light from the Graveyard to shuffle the Scarm from his hand back into his Deck, and he drew Danger!? Tsuchinoko?. He used Libic from his hand and Dante on the field, and Xyz Summoned Beatrice, Lady of the Eternal in Defense Position. In the End Phase, Scarm’s effect added Tour Guide From the Underworld to his hand. Kieser Special Summoned Junk Forward, and Normal Summoned Dark Grepher. Rosario detached Farfa from Beatrice, and Kieser negated Beatrice with Ash Blossom & Joyous Spring. The detached Farfa then banished Dark Grepher for the turn. Kieser considered his next move, but decided to concede right there! His combo had been stopped short, and he knew the explosive power of Burning Abyss would not let him come back from that. Kieser started with Marauding Captain, which Special Summoned Blue Mountain Butterspy. He Link Summoned Isolde, Two Tales of the Noble Knights, which sent Divine Sword – Phoenix Blade, Living Fossil, Noble Arms – Arfeudutyr, and Overdone Burial to the Graveyard to Special Summon Armageddon Knight. Armageddon sent Destrudo the Lost Dragon’s Frisson to the Graveyard as well. He used Armageddon and Isolde to play Summon Sorceress, then banished the Warriors to add Phoenix Blade to his hand. He played D.D.R. – Different Dimension Reincarnation, discarding Malicious to Special Summon Armageddon Knight once again, and it sent Ragged Gloves to the Graveyard. Summon Sorceress Special Summoned Ancient Cloak. He used Malicious to Special Summon another Malicious, and used that with Ancient Cloak and Summon Sorceress to Link Summon Rusty Bardiche. Its effect sent Silent Boots to the Graveyard to put Shade Brigandine on the field. He used Ancient Cloak in the Graveyard to add Silent Boots to his hand. He paid half his Life Points to Special Summon Destrudo from the Graveyard, then Special Summoned Shade Brigandine and Silent Boots. Brigandine and Armageddon were used to play Rhongomyniad. He banished Ragged Gloves from the Graveyard to send Fog Blade to the Graveyard, and he then used that to bring a second Silent Boots to the field. He used both Boots and Destrudo to play Number 75: Bamboozling Gossip Shadow, and attached it to Rhongomyniad for six Xyz Materials! Rosario had Danger!? Jackalope?, Sekka’s Light, Tsuchinoko, Fiendish Rhino Warrior, and Cir, Malebranche of the Burning Abyss. He drew Kumongous, the Sticky String Kaiju. Sekka’s Light let him draw Graff, Malebranche of the Burning Abyss and Farfa. He banished Sekka’s Light to shuffle Cir into the Deck, and he drew another Farfa. He Set Farfa and passed the turn. Rhongomyniad lost one Xyz Material in the End Phase. Rhongomyniad’s effect destroyed Farfa, which banished Rusty Bardiche for the turn. Rhongomyniad attacked directly for 4000 damage, and Kieser Set one card in his back row. Rusty Bardiche returned to the field. Rosario drew Gallis the Star Beast. He Set Farfa, and Rhongomyniad lost another Xyz Material. Kieser used Monster Reborn to bring Silent Boots to the field, then paid half his Life Points again for Destrudo. He combined Destrudo with Silent Boots to play Yazi, Evil of the Yang Zing. Yazi destroyed itself and Farfa, and Farfa banished Rusty Bardiche. Yazi then Special Summoned Mare Mare, which created three Mini Mare Mare Tokens. 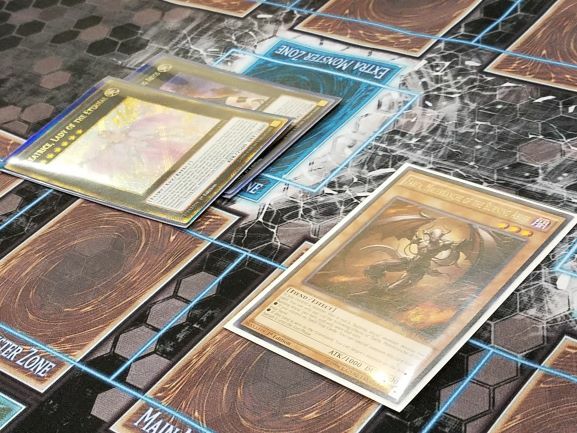 He used the four total Mares to play Space Insulator and Knightmare Phoenix, and sent his monsters to wipe out Rosario’s Life Points! Roman Kieser wins with DARK Warriors!